India’s beautiful block print fabrics have been a highly desirable and internationally marketable craft for literally thousands of years. Remnants of fabric printed with Rajasthani motifs have been discovered in the third century Roman trading town of Palmyra in Syria and others found in modern day Pakistan date back 4,000 years. 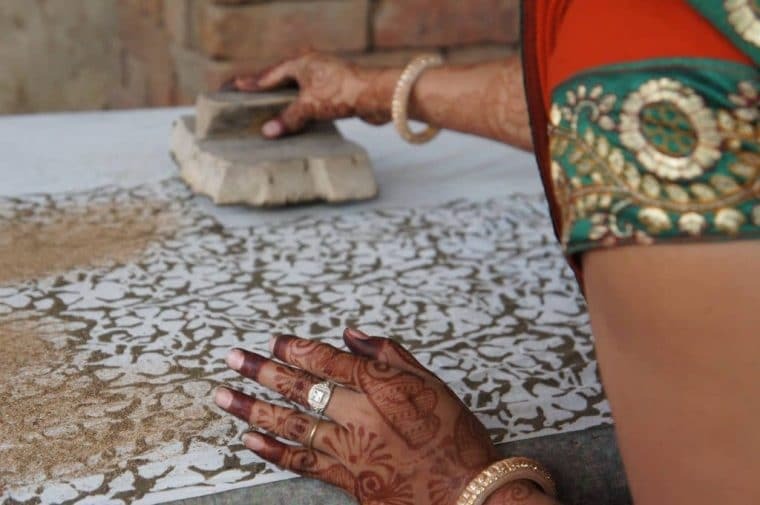 With its innate beauty, it is no wonder that our block printing workshop in Bagru is a highlight of our Women Only India: Fabric, Food & Fabulous tour. The hands on element of creating our own scarves is only one aspect of our time spent here, the other is visiting the homes of a collective of artisans in Bagru who continue to work together as a traditional printing community. Located 30km outside of Jaipur, the fabric of Bagru is traditionally characterised by its colour palette of deep red, iron black and indigo highlighted with green and yellow. Originally the fabrics produced here were used to produce clothes for the local community of merchants, agriculturalists and artisans. Each fabric print and colour combination a ‘uniform’ identifying which community the person belonged to and their marital status. Finished Bagru block printed fabric piled up after their final wash and waiting to be hung out to dry. Fast forward to recent history and block printing like many textile crafts, has not remained static. From the 1970’s freelance designers, both Indian and international, have created contemporary designs which have ensured the continuing appeal of block prints in fashion circles beyond India’s borders. With increased demand, there is also the the pressure to produce more quickly. This has seen some traditional natural dyes replaced with synthetic colours, screenprinting replacing traditional block prints and low pay as the artisans themselves are disconnected from the market for their products – the middle men are making the money. Block patterns are often inspired by nature with local flora and fauna feature heavily. Blocks to produce geometric and abstract prints are also carved. Some blocks are ‘sets’ with each designed to add a layer of detail and colour to the fabric design. Outside of the printing factories, in a corner of Bagru, you will find a collective of chhippas (printers), rangrez (dyers), dhobis (washers) and block carvers that continue to preserve the traditional methods. They are happy to keep their business specialised while working directly with the local and international designers who appreciate (and are willing to pay) for their handcrafted fabrics. Bagru itself is a non-descript Rajasthani town, there is little aesthetic joy in the architecture. It is a hodge podge of concrete buildings divided by streets and narrow lanes. Pye dogs roam and goats wander. The hogs joyously wallow in the muddy drains and holy cows sun themselves where they please. It is against this backdrop that we will be accompanied by one of Bagru’s master chhippas to learn about different block print fabrics produced in Bagru and visit the home based workshops of the people engaged in each step of the production process. The kaleidoscope of colours in the communal drying grounds changes throughout the day. Blues, and green dominated when we arrived, and orange prevailed by the time we left. As we walk from our bus through a wide gateway we quickly see that it is a hive of activity at the communal fabric drying ground. Men and women speed in on motorbikes laden with indigo resist dyed fabric that they lay out on the dusty dirt. The area is the size of a rugby field, with long coloured bolts of cotton suspended over the sides of the surrounding buildings, flapping in the warm desert winds. Husband and wife team laying out indigo resist dyed fabric. The dying and drying process is repeated until the right shade of blue is obtained. 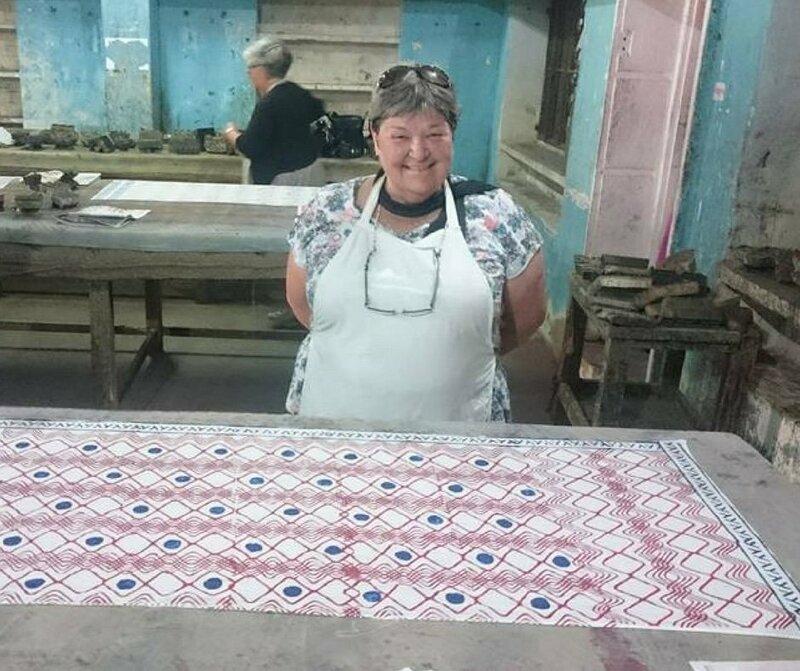 The fabric is then washed to remove the mud resist paste to reveal the block printed pattern. It is pretty clear from the outset that this is not a normal ‘tourist show’ where you get to play around with a few blocks and colours in a ‘workshop’ before being funnelled in to see what souvenirs you’ll open your wallet for…”with no obligation madam to buy of course!” There is no shop here. Fabrics are exclusively commissioned by and produced for the collective’s domestic and international customers. We weave our way through the village from house to house seeing the artisans at work on each step of the fabric producing process. For the indigo resist fabrics we see an elderly man stomping away to produce the mud-resist paste in a courtyard, while another gentleman rhythmically works at stamping the prepared paste with a large wooden block onto cotton that has been dipped in a natural fixing agent before being dried. Once finished he shakes sawdust over the whole bolt of fabric to absorb the moisture and fix the dabbu paste. The fabric is then spread out on the ground to dry in the sun. Once dry, the fabric will move on to another home to be dipped in an indigo dye bath. This process will be repeated until the correct shade of blue is reached and a dhobi can wash off the mud resist paste, the fabric can be dried again and folded ready for delivery. from L-R. Application of the dabbu mud resist paste to prepared fabric. An indigo vat set into the courtyard of a local home. Preparation of the dabbu mud resist paste in the courtyard of another house. One thing that is evident is that in each household it is a team effort with the husbands and wives largely working side by side. This is quite different to some other artisan communities where the roles of men and women are clearly segregated. Full of knowledge after seeing each step of the fabric printing process from block carving, to preparation of colours, block printing, indigo dyeing, washing and drying; we all make our way to a workshop to have a go at block printing our own scarves. Dhobi’s are a critical cog in the fabric production process. The base fabric such as cotton, silk or linen must be washed to remove impurities before moving on to be dipped in a fixing solution. Fabrics are also washed at the end of the process. The cotton is pinned out on long tables and from a shelf crowded with blocks big and small we make our choices. Personally I’d quite happily sit there for hours sorting through the different options and planning what block I am going to use where. Some of the ladies in the group quickly settle on what blocks they want while others make a few return trips to the shelves to find a block that might just work a little better with their plans. After some instructions about ‘loading the colour’ on to the block and ensuring it gets transferred onto the cotton without leaving gaps or smudging we are away. A group of chhippas are on hand to help us. They step in periodically to provide tutelage in any of the technical aspects such as pattern matching and what to do as you approach the edge of the material. If you would like to find out more about joining our India: Fabric, Food & Fabulous tour departing 14th October 2018 or you would like to include a visit to Bagru as part of a tailor-made tour, please get in touch. The group of artisans that we visit in Bagru depends on availability. These are real working businesses and as such commercial demands means that we work with several master artisans in the Bagru community to ensure that we can offer this unique experience.